touches of sense...: Cartoon Characters? F2F , as I understood it, can be via Skype or a Hangout. 3D is when we are together in a physical space. Then there was Tania suggesting in a tweet that tweeps such as @Bali_Maha, @dogtrax, @sensor63 et al in her PLN were 'cartoon characters' - if she had not met them F2F or should I say 3D? So is that my friends what we are to one another - Cartoons - (on)line drawings? Like a canary to a black and white cat that was a red rag to a bull. 1) Are our online 'friends', 'follows' 'followers', akin to Loony Tunes? 2) Are our offline 'friends', 'follows', 'followers' not akin to Loony Tunes? I can quite accept that @dogtrax or should I say Mr Hodgson K. qualifies as an honorary cartoon character. His lifetime achievement to cartooning in itself would merit such an accolade. I am not sure that I am quite yet ready to take on the caricature mantle without a fight. The strange case of Culture Club. I can boast quite openly that I once met Boy George F2F (3D) outside the Mud Club in central London, while driving a London cab. To be accurate, I was parked (as in stationary) in front of the Mud Club. 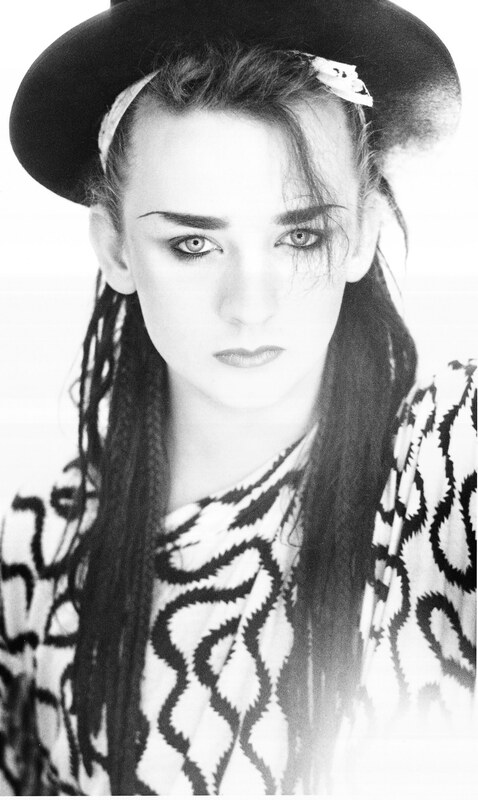 Boy George was undoubtedly a larger than life character, dressed to the nines, painted in broad strokes, armed with an infectious laugh. He was surrounded by acolytes, disciples, hangers-on, groupies, and various fawning clubbers, similarly attired. They appeared to be infected with George's laugh. I am quite sure the boy George had more depth than this vignette. There was no apparent desire among the performers to go beyond the make-up. So, I would say Tania that being a cartoon character is not exclusive to online avatars. The strange case of the decoy learner. I had the strange impression that at one time in my life, I was perfoming in a pantomime that was recognisably school. I was the teacher operating the Cambridge text-book franchise. The students were the masked chorus who followed the lesson plan scenario to the letter (3D p45). The routines were will-drilled, will-oiled, caricatures of learning. We might have been in a physical space but I couldn't suggest that it was 3D learning. It might even have been hard to describe it as F2F learning. It was rather a flat representation of learning. "Aha those must be learners." 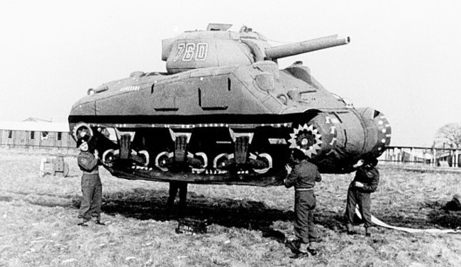 rather like the Germans did during the war when they were conned by the allies brilliantly imagined inflatable tanks. Ah ha A tank. Donner und Blitzen. A flying tank. The strange case of the feral chicken. I confess that I have never met Maha, Terry, Keith, Clarissa 3D. I have however met them F2F in hangouts. I would suggest that the time that we spent before online blogging, tweeting, commenting, et al has enabled a depth of connection which is far superior to that that I 'enjoy' with many of the colleagues that I have 'known' 3D over a number of years. Many of the my 3D colleagues are unknown to me, they remain line-drawings. I have a better impression of my PLN's life thanks to meeting up in hangouts, thanks to an authenticity of exchange, thanks to a shared language which goes beyond our differences. Avatars, text, zeegas are accompanied by memories of Cairo traffic sounds, Kentucky roosters, Florida coffee, Brazilian t-shirts, stories of feral chicken. I sometimes feel that a distinct voice, that is evidenced in this Touches of Sense blog, has become a distinct character. There are times when I feel distanced from it's mannerisms, its annoying ways with words. There are times when I feel that I shall introduce a new character to stem its irritating flow. I am reminded of Maha's reflections on how she feels at times as catalogued as an 'exotic'. I am reminded of Susan's reflections on her various incarnations. I wonder if despite ourselves we become characters in others' performances. We take up our roles like tin soldiers, like Winnie the Pooh, Piglet, Eeyore, Tom and Jerry in a 2D world of intersecting comics. I throw in the towel. OK Tania, I accept defeat. I am a caricature. I am happy to be added to your online bestiary of amusing roustabouts. This comic metaphor has become too complex for the cartoon @sensor63. He is one of the Connected Comic Characters. He must live with it. Oh but you can be a character without being a caricature! I imagine you not as a colorful well-outlined cartoon but as a smiling multi-faceted interesting idiosyncratic fellow who has the fantastic habit of surprising me with his writing. If I must be a cartoon character, I choose Gir in Invader Zim. I do a fine line in serious frowns on weekdays. I quite the idea of being idiotsyncratic. Will add to CV. Can I admit that you're sort of an exception to my (very loose) rule? I often feel close to someone based solely on their writing, but because a lot of your writing beforehand was a bit cryptic and aesthetic rather than straightforward, I did not begin to feel close to you as a person until we met on day on hangout and talked? The strange thing is that your writing style has not changed (much) since then, but because I felt like I knew you, I could understand it more... Or something. It's not the case for me in general, though, that I need the f2f to make me feel I know someone deeply. Have never hungout with most people, and I only ever hung out with you that one time. I agree completely that some ppl we know in 3D and yet we know them in no depth at all. You'll like my upcoming guest post for digiwrimo because it talks about just this issue. We only ever know people partially, of that I am sure. Your cartoon character musings gave flight to whimsy of the most delightful kind, Simon. How liberating it is to live as a cartoon character, defying death, enjoying metamorphoses. It is my dream. What d'ya mean? Me unreliable? This is fact mate! Cast iron.